What is a Fertility Blood Test Panel? Fertility Panel is a blood test which consists of various tests that measure components in the blood that are associated with fertility. Follicle Stimulating Hormone (FSH): stimulates the ovaries to produce the follicle. A high FSH level (generally over 11) suggests that the follicles are not responding as well as they should be to FSH stimulation. Estradiol: the main form of estrogen produced by the follicles. Low Estradiol levels, particularly when associated with a high FSH level, suggest menopause. Luteinizing Hormone (LH): is an important factor for ovulation and, in conjunction with FSH, helps evaluate the efficacy of ovulation. A consistently high LH level is suggestive of menopause. Thyroid-stimulating Hormone (TSH): an abnormal TSH may indicate hyperthyroidism (low TSH) or hypothyroidism (high TSH). Total Testosterone: Women’s ovaries also make small amounts of testosterone. Estrogen precursor is its main role and it also influences behavior. 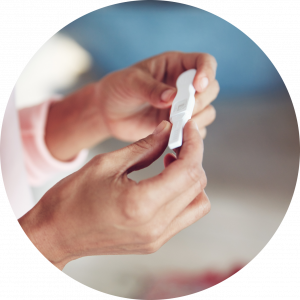 Who should get a Women’s Fertility Test? To evaluate cause of infertility or difficulty in getting pregnant or any disorders. To evaluate the reproductive system of a female. To monitor and evaluate levels of hormones that assist in fertility.